Azeri and Armenian leaders have made significant progress in talks on the disputed enclave of Nagorno-Karabakh, a French mediator has said. But Bernard Fassier, of the Organisation for Security and Co-operation in Europe, said "some difficulties" had been identified. A fragile ceasefire has been in place in the region since a brutal war there in the 1990s. Both nations lay claim to the enclave, currently under Armenian control. 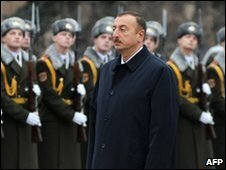 Earlier Azeri President Ilham Aliyev warned he could use force to seize the enclave if the talks failed. He said the talks, in Munich, Germany, were the final hope of settling the issue peacefully. Mr Fassier said he and fellow mediators would prepare a new meeting, but gave no indication of when it might take place. "The discussion [led] the presidents and us to identify problems that still have to be resolved," he said. "But what is important, that we have been instructed to resolve these problems." US mediator Robert Bradtke said he was impressed by the political will to seek a settlement. "I think today what was impressive was the way the two presidents worked with us, ... their willingness to discuss points that are quite difficult and quite controversial and I think, as someone who is relatively new to this process, that is what impressed me the most," he said. President Aliyev and his Armenian counterpart Serzh Sarkisyan left the talks without making any comment. But in remarks broadcast on Azeri TV on Saturday, Mr Aliyev said that if the Munich talks failed to reach agreement he would be "left with no other option". "We have the full right to liberate our land by military means," he said. Some 30,000 people died in the Nagorno Karabakh conflict, which erupted after the mountainous region declared independence in 1991. The region and seven surrounding Azeri district have been under Armenian control since the Russian-brokered ceasefire in 1994. Azerbaijan has never ruled out military action to take back the land and has spent billions on dollars on building up its military. The meeting was the first since Armenia and Turkey - an ally of Azerbaijan - normalised diplomatic relations after a century of hostility. That move has left Azerbaijan feeling isolated, says the BBC's Tom Esslemont, in the South Caucasus region.